Here is the story of the Prairie Popsicle Stick Bridge told in video format. As far as I know, this is the longest working popsicle stick bridge that a person can walk across. If you know of a longer bridge that does the same, please let me know. 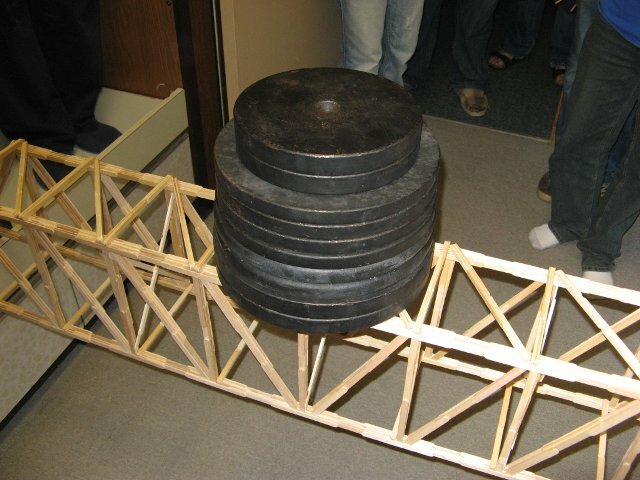 The largest popsicle bridge was built back in 2008 in my dorm room at Prairie Bible College. For many nights I slept on the floor, as I was using my bed space as a worktable to glue the bridge together. This bridge is long, it is large, and super cool. The testing of this bridge was a community event, as you can see the large number of people gathered to watch. This bridge definitely is one of my favorites that I have built over the years. Two years later people are still talking about it at the school. What if the bridge is made with popcicle sticks and Toothpicks? And it does the same thing .Will it still beat your record . But won’t it stay the same because you built the longest popcicle stick bridge this might be considered to be the worlds largest popcicle stick & toothpick bridge? 51 queries in 0.512 seconds.